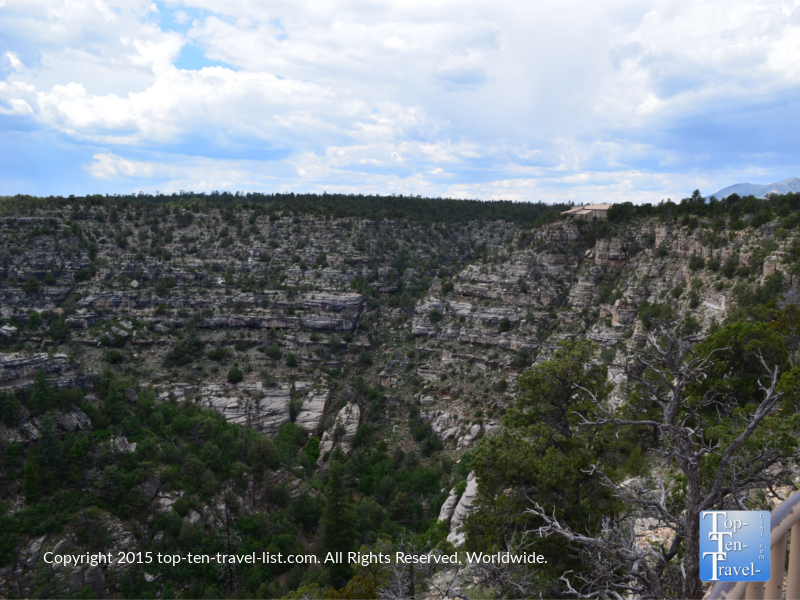 Exploring Gorgeous Walnut Canyon National Monument in Flagstaff, Arizona - Top Ten Travel Blog | Our experiences traveling throughout the US. 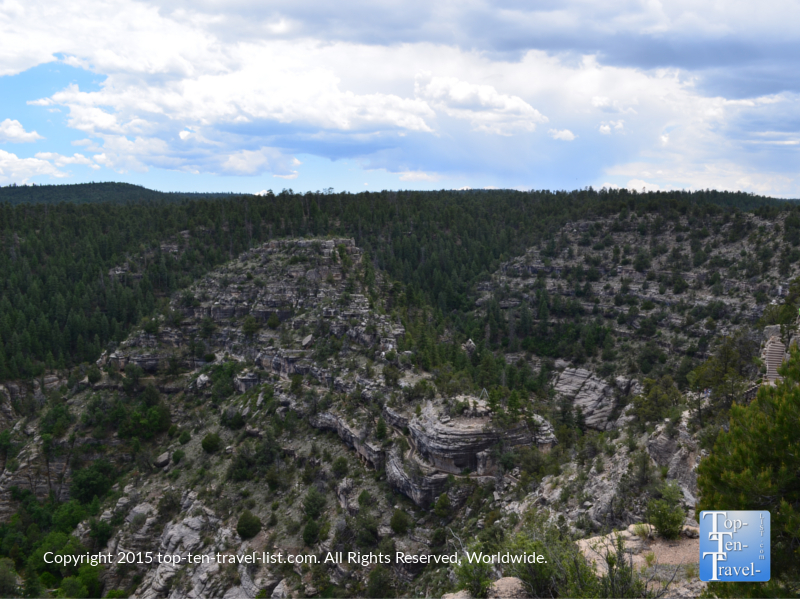 Walnut Canyon National Monument is one of the most beautiful places to explore in Northern Arizona. 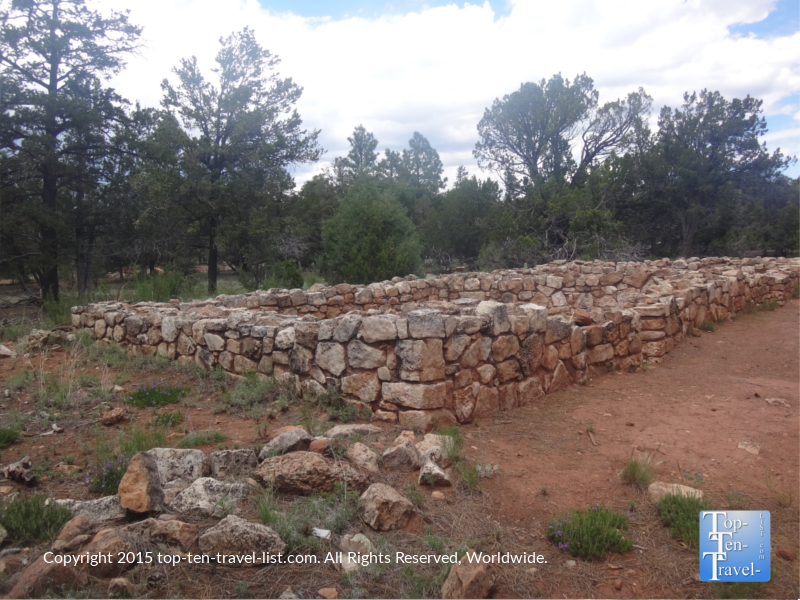 Located just 7 miles outside of Flagstaff, a day trip is easily incorporable into any vacation. Historic artifacts have shown that Archaic people occupied the canyon thousands of years ago. The first permanent settlers, known as the Sinagua (from the Spanish name for the region meaning “mountains without water”) lived in the area from approximately 6oo to 1400 AD. Although they left behind no written history, archaeologists have learned about their living situations through various means such as exploring the rimtop and canyon cliff dwelling sites, studying left behind objects such as tools and ornaments, and comparing the Sinagua other Ancient peoples of the Southwest. A 2 bedroom pueblo from around AD 1100. 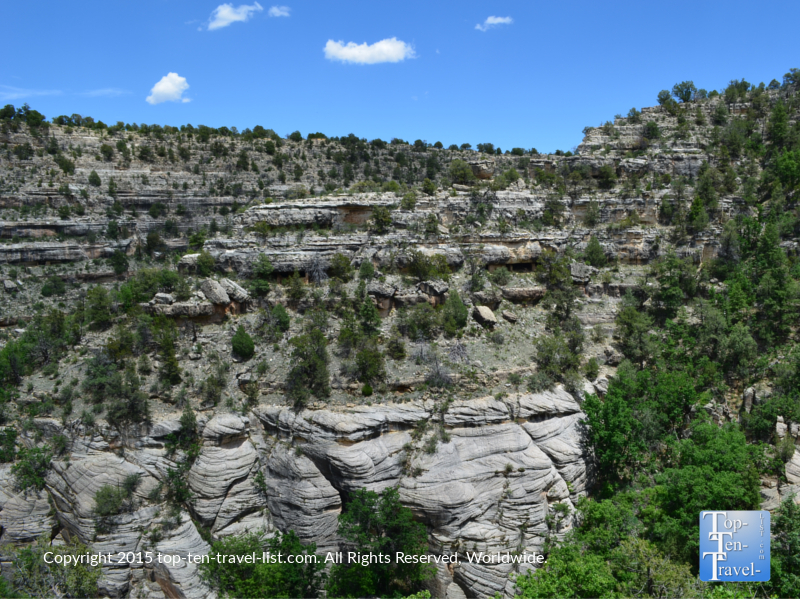 The canyon rim was used primary for farming, mainly drought resistant crops like corn and beans. More than 20 varieties of plants, which were used for food and/or medicine, can still be found today. These include elderberry, yucca and wild grape. Homes were usually built on cliffsides, which faced the south and east, in order to take advantage of the sunlight. 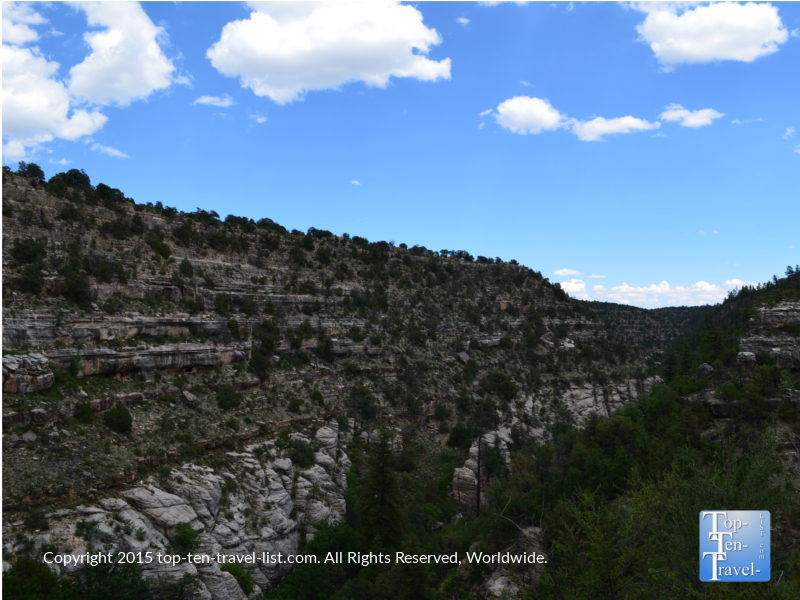 Walnut Canyon is a truly amazing sight. The 60+ million year old canyon is 20 feet long , 400 feet deep, and 1/4 mile wide. 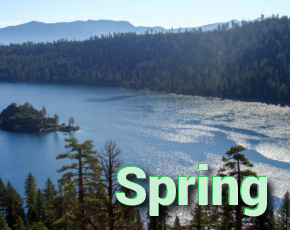 As you hike the trails, you will notice a diverse assortment of plant life including ponderosa pine, juniper woodland, upper Sonoran desert, mixed conifer forest, and riparian bottomlands. 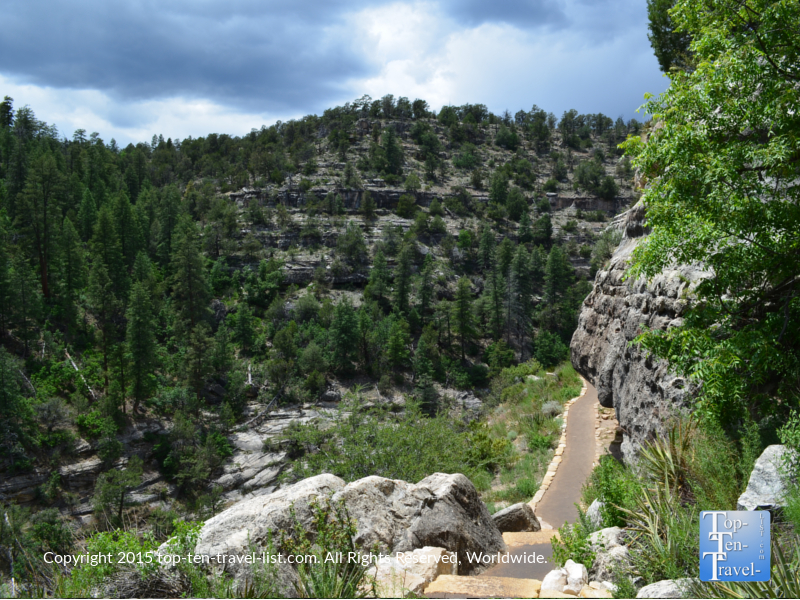 There are 2 trails to enjoy the beautiful scenery at Walnut Canyon National Monument: The Rim trail and the Island trail. Both trails can be easily hiked in a single visit. Views are great along both trails, especially the Island Trail. The Rim Trail follows a short, easy path along the rim of the trail. You will pass beautiful ponderosa pine forests along the 0.7 mile round-trip journey (the hike should take about 30 minutes or so). 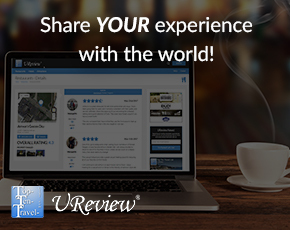 There are 2 scenic overlooks to enjoy the beautiful views. 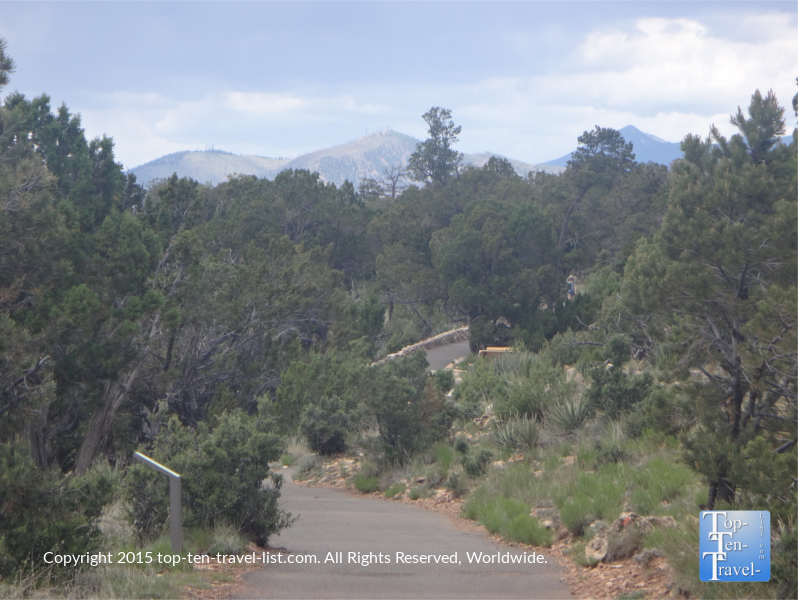 In addition, you will experience some nice views of the San Francisco Peaks (on clear days). This trail is very easy and suitable for almost everyone. Check out these great views from the overlook! Fantastic views from one of the overlooks.